We continue reviewing the latest systems to embed your 3D world in your website or Facebook profile. We saw Lively, 3DXplorer and Vivaty in the previous post. Our list continues with SceneCaster, ExitReality, and the ActiveWorlds plugin for Facebook. SceneCaster has high CPU requirements (2.8 Ghz Pentium4) but it can also run if your CPU is not so fast, although with a bit of lag. Only 256 MB or RAM are required. You need Windows XP or Vista and Flash 8. SceneCaster is an original concept. 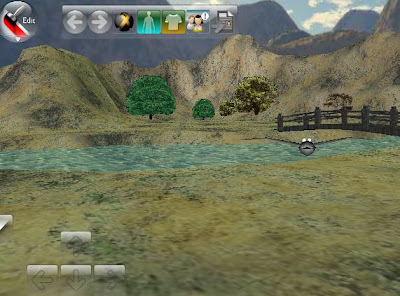 You can create a 3d world using its editor, and design it in 2D and 3D. You can also browse and move through your scene in 3D in the editor. Then, you can also create a navigable slideshow that you can embed in Facebook, or upload the snapshots of your worlds to Flickr directly from SceneCaster. There is no limit in the number of scenes you can create and save in your account. And you can create your scenes with the objects of a big catalog that contains all kinds of geometry, or design your own with Google Sketchup (.skp file format). For now, you can't use streaming video. But you can insert your own images. There are three options to control the access and edition rights of your scenes: they can be public (for everyone), private (for you only), or "View only" (everyone can see them, just you can modify). You can create your avatar and customize it and even add a voice recording to it, but it's just for making it appear in your profile and scenes slideshows. I was a bit surprised because I thought that I'll enter another 3D world but found a series of beautiful slideshows of rendered worlds. It made me wonder how could I navigate on 3D. It is made with the application that you must install to edit your own world (or others... if you set a world as "public", everyone can edit it). 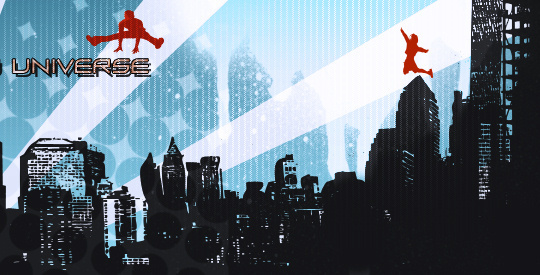 You must register, and then click the "Make A Scene" button in SceneCaster's website, and the download starts. After that, you can start editing your own worlds. You will see there's a tab for 2D and another for the 3D view. The editor is not hard to use, although it may require some time learning. Remember that your computer must have a quite fast CPU. The scenes have no movement. They are static. They are not multiuser and there's no avatars or chat. This is a platform for design mainly, not for socializing. Although it's on the SceneCaster website or in Facebook or Flickr where you can really socialize with this, sharing your scenes with people. What you generate with this application can be embedded in Facebook or uploaded directly to your Flickr account. Navigating the 2D views of your scenes doesn't need to install anything. It's a good solution for all those who like decoration. There are real artists doing great things on SceneCaster. It's not multiuser, nor has chat or 3D avatars. High CPU speed requirements for edition. This is not truly important, as hardware improves through time. What could be improved in SceneCaster? SceneCaster is good as it is. Even more, I think it contributes with a very original concept to the universe of virtual worlds. If you like decoration and enjoy building spaces where you can enjoy the pleasant ambient that you create, or taking snapshots of 3D worlds, SceneCaster is your application. It is also for those who enjoy sharing their works with others, and are active users of Flickr or Facebook. Watching the always growing gallery of worlds done by others is always a pleasure. I was surprised with the beautiful scenes that many people have created. 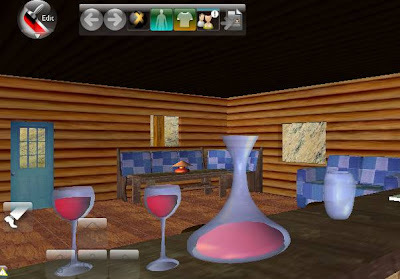 WARNING: Read this article: http://news.hiperia3d.com/2008/09/worst-of-exitreality.html before using or linking your VRML worlds. The security flaws discovered by Hiperia3D News have called the attention of the VRML worldbuilders community. If you are one of them, read it. There are some dangers that were noted in this review before it happened. ExitReality is a new solution that has a very original feature: it can turn any website to a 3D multiuser world. And when I say any, I mean: your website, the websites of others, and the pages of social sites like Bebo, YouTube, Flickr, MySpace, AIM, Friendster... any site. It uses VRML/X3D as file format, so you can build a VRML/X3D world and open it with ExitReality. That way, you have 2 ways to use ExitReality: as a multiuser VRML/X3D browser or as a way to visit any website in 3D. 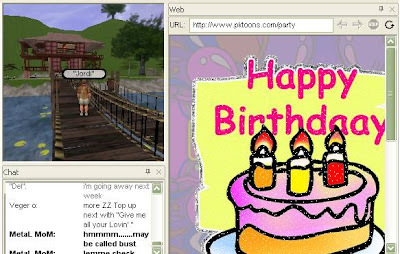 The main window has a neat interface, with buttons for taking all the actions you may wish, from controlling your avatar to watching who's online with you, and manipulate the scene. You can also add other users to your buddy list so you know that they are online, and where. 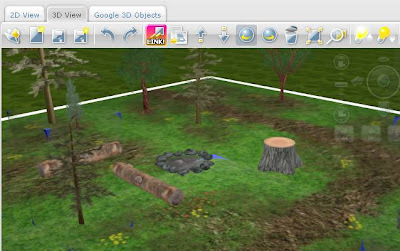 Panoramas, objects and even an entire scene can be dragged and dropped in the 3D window so it changes what you're viewing. After you've edited an scene, you can save the changes, that will be remembered. The drag&drop support also works for avatars. To wear an avatar you simply drop it over yours. Two important places for learning about this solution are the ExitReality Knowledge Base and their blog. It was very easy to start using ExitReality, that installs as a browser plugin after you have registered. Its interface is very intuitive, and you don't need to read anything to use it. You can change your avatar from a catalog and access the worlds that are online. The movement of the default avatars is quite good, and their appearance. ExitReality is compatible with Blaxxun's shared events and avatars, so shared behaviors and avatars done for Blaxxun also work in ExitReality. It is not clear if you can upload your avatars or specify them as a parameter. You can create almost everything using VRML/X3D. Drag&Drop objects to the world, and avatars, panoramas, even whole worlds. Not as easy to use as Vivaty but rather easy. Very fast if the worlds you visit are properly optimized, as it uses VRML/X3D. Floating chat with non-resizable window that is quite annoying. Some people reported that there are bugs that make the application to close. But remember that it is in beta and this may be fixed as time passes. Some authoring and ownership issues, as explained below. What could be improved in ExitReality? ExitReality inherits the good things of previous and existing VRML browsers, and improves them with new capabilities. Being so, it suffers from the same problems as other VRML viewers in the past that are browser-based. There are some privacy and ownership issues due to this. The URL of the world can be accessed, so people may look to your code easily, as VRML code is text viewable in any editor, or gziped text. As I say, this also happened in other VRML browsers, so if ExitReality fixes this, it will take advantage over them. Avatars and worlds have no editable usage rights. The author of worlds and avatars are unknown. They could add a floating tooltip or a text that said in the catalog who is the creator of the worlds or avatars to prevent this. For now, you can add a sign in-world using an image texture to show that you're the author and your website, copyright, etc. That's what I've done. I decided to use ExitReality because it uses VRML/X3D, and for the ease of creation of links to a scene. Using just a single line link to enter your 3D world is a fantastic feature. And turning your website to 3D is as easy as adding that hyperlink as I explained. Your visitors will be asked to register and add a plugin, and guided through the process. If they already have the plugin, they'll simply enter. 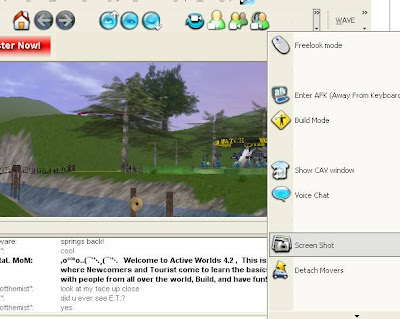 Active worlds is one of the most veteran 3D chat and virtual worlds community out of the whole world, online since 1997. There are two types of people in ActiveWorlds: citizens and tourists. If you don't register and pay for your citizenship, you are a tourist. Unless you're a citizen, you may build things but others may modify or delete what you build. ActiveWorlds added customizable avatars with their 4.2 version of their browser. It uses a standalone application as browser. But you can also embed it in your Facebook profile. ActiveWorlds has everything that one can expect of a big 3D multiuser worlds community. I tried to add the Facebook application to my profile directly, and I was asked to download the ActiveWorlds client. I did install it, and then went back to Facebook and added the application. It also asked me for an update, and after that I was asked for a nickname and email. The application will remember this, so you won't need to enter them again. I entered in a world that was full of colors and natural landscapes. The ease of use and the number of different features of the software surprised me, as everything that I wanted to find was there where I supposed it was. When someone posts a link, you just have to click it and it opens in a built-in web browser. This makes very easy exchanging links and showing them to your friends. I saw a number of people chatting with their avatars, mostly citizens and some tourists. I took some time browsing the world, watching waterfalls and forest houses. I noticed the community was rather friendly. Tourists are welcomed warmly and the behavior of citizens is polite. It can be embedded in Facebook. URLs are opened in a browser window inside the AW application just clicking. Visual effects like water and others. Real voice chat, that can be enabled or disabled. You can take and move objects with you. Chat inserted under the 3D window, not floating. You can make it float or auto-hide it if you like. Nothing at all. Some annoying chatbots when you enter as a tourist, although they provide good information. If we had to say something, we could ask it to be cross-platform. What could be improved in ActiveWorlds? As everything, it could be improved. But the overall quality is very high. What can be improved in ActiveWorlds is just make all the existing features better, that is what they've been always doing. As tourists can't build something persistent, in this case you should become a citizen. But if you enjoy entering as a tourist, it's also a good place to go. Those who will like ActiveWorlds are obviously people that want an independent 3D world of their own, but also want to belong to a group of people with a strong sense of community. I can't recommend any of them over the others (except for Lively, that I can't recommend for now). You may prefer one of them based on your expectations and needs, but at least with this 2 parts review you can have an idea on what they offer to you, and what kind of 3D worlds can be created with them. Now it is your turn to test them, share your thoughts about these technologies with us all, and comment what you found when you tested them, and maybe also suggest some that are not on this review series. There was an error with SceneCaster that is now corrected. You can use your own images in SceneCaster's worlds. Another annoyance with ExitReality is that when installed or updated, it replaces any other VRML plug-ins that you haqve, causing you to re-register them (ie: BS Contact or Blaxxun). A minor annoyance, but should be noted. Other than that, I've had very few problems with it, still would like to see it be able to list populated worlds rather than having to check your "buddy list"
@Omind Yes, that happens when one installs several plugins for the same things. As you say, just installing Blaxxun or BSContact again fixes it. You're right: they should add an option in the installer (as is usual in most programs) asking the user if they want ExitReality as their default VRML/X3D browser. Greatest platform on that list, lots of features and friendly people who will help you! I see a lot of AW friends here... Yes, it is very remarkable, I liked it.